Cake Decorating Airbrush Kit with Premi-Air Baby compressor and Sparmax SP-35C airbrush. This kit contains everything you need to get started in airbrushing cakes and sugarcrafts. The kit includes a getting started booklet. If you want to learn how to use your airbrush kit quicker and get expert tips, or if you want to try the equipment before you buy, please consider our hands-on airbrushing courses. Please click on the contents of the set listed below for further details of each item. A set of 12 Kopykake Kroma Kolors is the paint provided with this kit, as these standard colours are easy for cleaning, learning, practicing and general-purpose airbrush effects from broad coverage down to fine detail. The Sparmax SP-35C airbrush has a 0.35mm nozzle and pre-set handle. Click here to read more about the airbrush. 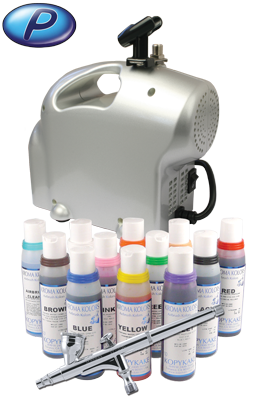 For the unsurpassed professional quality of an Iwata airbrush, please see the Iwata Cake Decorating Airbrush and Compressor Kits. The baby compressor is suitable for occasional use - for about half an hour, two to three times per day. If you need a compressor for heavier use, please click here to see other kits. Substitutes EX-ST-ZM03 is out of stock. We may substitute similar products.